Mature chickpeas can be cooked and eaten cold in salads, cooked in stews, ground into a flour called gram flour (also known as chickpea flour and besan and used frequently in Indian cuisine), ground and shaped in balls and fried as falafel, stirred into a batter and baked to make farinata or panelle. 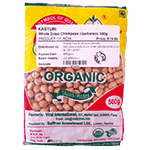 Chickpeas and Bengal grams are used to make curries and are one of the most popular vegetarian foods in India, Pakistan, Bangladesh and the UK. Garbanzos also have a delicious nut like taste and a texture that is buttery, yet somewhat starchy and pasty. A very versatile legume with health benefits. Product of India.